Thanks to our newest Featured Foodie, Real Mom Kitchen, we have this sandwich recipe just in time for the big game! Combine garlic, rosemary, bay leaves, soy sauce, and water in a slow cooker. Stir to combine. Place the roast in the liquid in the slow cooker. Cook on low for 6-10 hours. Remove roast from slow cooker and shred. Place liquid from slow cooker in another container and remove bay leaf. Return shredded beef to slow cooker. Add a small amount of the reserved liquid. Add just enough to make the beef nice and moist. Place sliced rolls or buns on a baking sheet. Place one slice of provolone on each roll. Place on the center rack of an oven under the broiler. (placing it on the center rack prevents burning) Broil until cheese is melted and bread is golden brown. 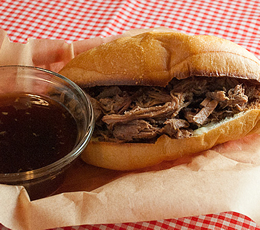 Serve meat on the rolls or buns along side reserved liquid for dipping.